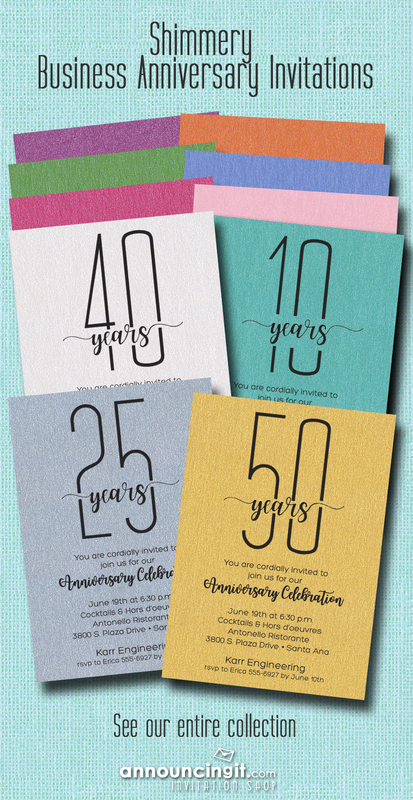 Celebrate the anniversary of your business with beautiful shimmery invitations in lots of colors – Purple, Orange, Green, Blue, Hot Pink, Pink, Turquoise, White, Silver and Gold. Use for any anniversary year on any color paper. Comes with coordinating shimmery white envelopes. Use our wording or change it to match your own special occasion. This entry was posted on Wednesday, June 6th, 2018 at 9:47 pm	and is filed under Business, Invitations. You can follow any responses to this entry through the RSS 2.0 feed. You can skip to the end and leave a response. Pinging is currently not allowed.